Today I had a some energy I needed to expel. As soon as I walked in my door I changed and went straight to the gym (my awesome basement) and decided EFF IT! This is my life and I need to live it and enjoy it regardless of this damn sling. I’m lefty dominant so I figured who cares if I make my right arm a little stronger than the left during this period of recovery. There’s a first time for everything as the saying goes. I feel really good doing something active again, even if I only worked one side of my body. Enjoy my ugly attempt at one arm burpees. 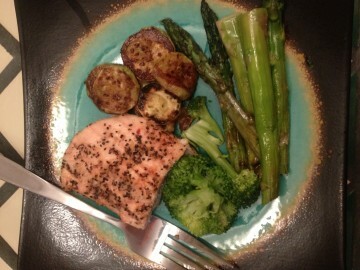 All followed by a healthy dinner consisting of chicken breast, asparagus, broccoli, and zucchini! Yum. Oh ya and guess what…the world didn’t end today. Cheers!